Curated by Anna Walcutt, 2011-2012 Curatorial Intern, these prints give a glimpse of the range of prints produced in the 17th century. Featuring engraving and etching the prints include religious motifs, genre scenes, and a 17th century celebrity. Elizabeth is a portrait of Elizabeth Stuart (1596-1662) the British wife of Frederick V, the German Protestant ruler of Bohemia. 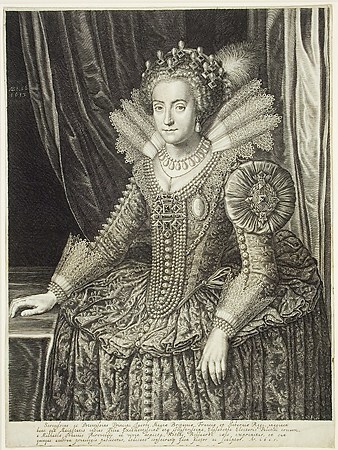 The engraving is dated 1613 – the year of her marriage. Frederick was known as the “Winter King” because his reign as King of Bohemia lasted only one year before he was defeated in battle and fled to Holland. Elizabeth spent the next forty years in exile as a result of the political instability and conflict between Catholics and Protestants. In 1661 she returned to England, where she died the following year. This series of small, rotating presentations showcases the exceptional breadth and depth of the UAMA print collection. These selections offer focused consideration of a particularly significant artist or theme, and elucidate some of the most influential developments in the Western printmaking tradition.